Well, here are the results from the RAZR MAXX run in our battery test, people. Prepare to be impressed! As always, we will begin with the device’s talk time numbers. Here, the Motorola Droid RAZR MAXX achieved the mind blowing 20 hours and 24 minutes. This is almost 8 hours more than the second closest competitor we’ve tested this far, which means that Motorola’s latest creation is entirely in a league of its own in this category. The smartphone topped the web browsing rankings as well, though in a less assertive fashion. With 7 hours and 23 minutes of Wi-Fi browsing, the Droid RAZR MAXX bested the HTC Radar by mere 6 minutes. The predominant white backgrounds of the web pages proved to be a challenge for the Super AMOLED screen of the handset. Still, with 3300 mAh on tap, the device found its way to the top of the chart. You can reasonably expect the web browsing time to decrease, should the handset run on Verizon’s speedy LTE network. It is still however, better than everything we’ve tested this far. The phone’s video playback is also quite impressive. With a result of 14 hours and 17 minutes, the Motorola Droid RAZR MAXX gives you almost 5 hours more than the second best device we’ve tried this far – the iPhone 4S. This is enough video playback time to keep you entertained during an round trip flight between New York and Los Angeles. And now it is time for the most important score in our battery test – the endurance rating. 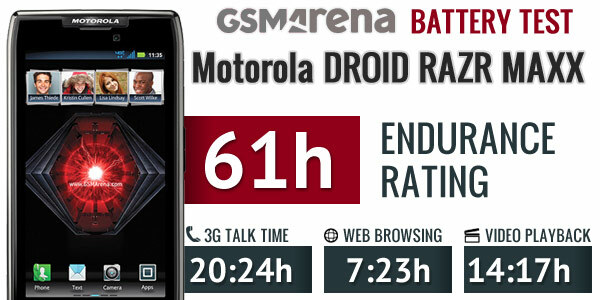 With a result of 61 hours, the Motorola Droid RAZR MAXX simply blew all competition out of the water. The device’s score means that you will need to recharge it every 61 hours if you use it for an hour each of phone calls, web browsing, and video playback a day. In case the battery performance is the deal breaker for you in a smartphone, look no further. The Motorola Droid RAZR MAXX sits alone on top of all rankings. Most importantly, it must be pointed out that the device’s pocketability and ergonomics have barely suffered, despite the presence of a battery this big. In case you want to find out more about the device, stick around for our review, which is well under way.